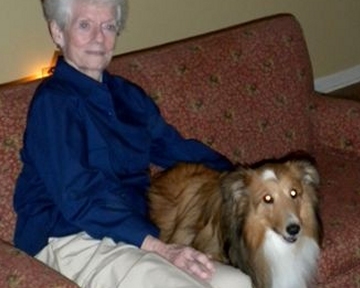 There are many heart-warming, and heart-rending, stories that we can all share about our older Shelties. Just read some of these stories about some senior Shelites that illustrate that, just because a dog is older, it doesn't mean that they are useless. Hi! 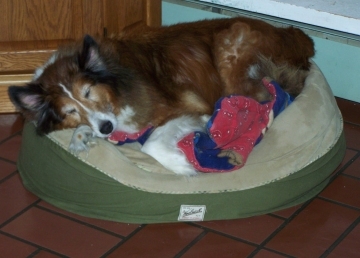 I'm Nicky, an 8 year old tiny, 12 pound sheltie. I was born in Missouri and later was bought by a breeder in Arkansas. From there I went to a rescue in Collierville, Tennessee then I was transported to Knoxville, Tn where I'm now being fostered. Let's just say I had a less than ideal life in the past, much of it without any real human contact or love. I don't know how to play with toys or other dogs but I'm learning how to interact with people now and am beginning to enjoy being petted and touched. I bounce away but come right back for more contact. I love my crate and in fact it's very important to me. I venture out little bits at a time to explore my new surroundings but run back into it when unsure or afraid. I came here afraid of everything but I already have much less fear. The first picture of me was taken the evening I arrived. In the other pictures and the video you can see how brave and relaxed I am becoming. Now a note from my foster mom: Nicky is a real darling of a dog and will make someone the perfect pet. Someone who has a lot of love and time to devote to his learning about the big world he finds himself in. He is absolutely adorable. He would thrive in a home without other dogs because of his fear of them and not understanding when they want to play and his learning process would benefit from being the only dog. Nicky is learning to come when called and walk on a leash...both things that are difficult when a little one is so fearful of his surroundings. A fenced yard is a must as well as having a crate since he is crate dependent. Nicky is house trained and hasn't had a single accident. 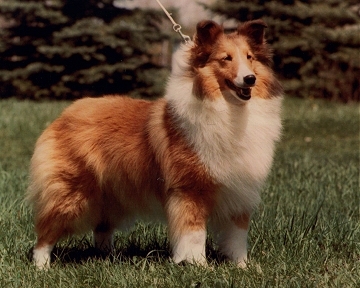 Chewie (Chewbacca) is a large shaded sable and white male sheltie. He weighs 40 lbs. and is 20 in. tall and the vet estimates his age to be around 10 yrs. Chewie was found by a good samaritan lying in a ditch. We are so glad someone cared enough to save this precious boy. 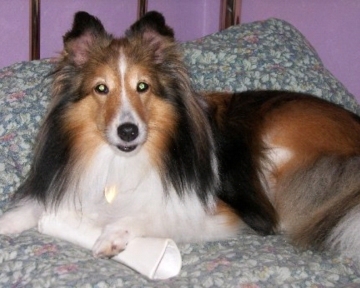 Chewie is one of the sweetest and most gentle laid back shelties I have ever fostered. He gets along with other dogs, loves being with people and getting loved on. Chewie is also doing great with his house manners. No potty accidents. Loves to nap and sleep at night in his crate but will also sleep on a dog pillow or blanket. Chewie is heartworm positive but is being treated and should make a complete and speedy recovery. 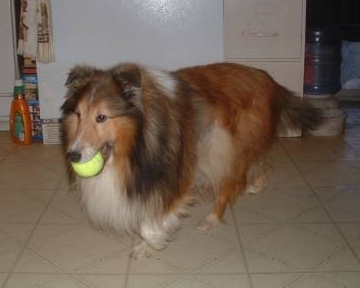 If a larger, older sheltie is right for you, you will not be disappointed in this sweet and loving boy. Meet Honey, our newest rescue catching up on some needed sleep. She's 13 years old, and sweet as sweet can be. Honey's owner died and left her all alone in the world, but not anymore, she's found a safe haven with LISSR. Best of Breed at 1983 ASSA National Specialty from the veterans class. Owned by Ray and Dorothy Christiansen. She was a senior dog when she won and passed away at 15. Even though I have passed my legacy lives on. My name is Mr Rusty and I lived in a home until I wasn't cute any more and I didn't play like I use to, it was then that I was disposable and turned into an Animal Shelter to be put to sleep. I was considered unadoptable because I was 14 years old and had a lump on my left shoulder. An rescue angel found out about me and made one phone call to The Wild Bunch and I went to live with them. I had surgery on the lump and it turned out to be nothing and I had many adventures for 5 more years before I went to the Rainbow Bridge. Here you see me with my tennis ball that I loved to play with and when thrown I would chase it down with my old legs and bring it back to my human. We seniors have a lot to give in our old age but most of all we know how to love and you don't have to house break us or worry about your shoe strings getting chewed up. The Wild Bunch continues to take in seniors mainly because of the experience they had with me and they know that no matter if you get a young dog or an old dog there are no guarantees in life. 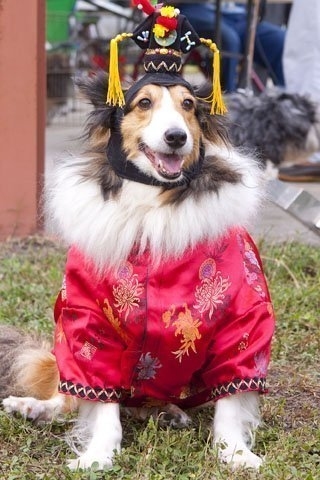 Flair is an eleven year old sheltie, still actively working as a medical alert service dog and doing pet therapy with grieving children and their families. 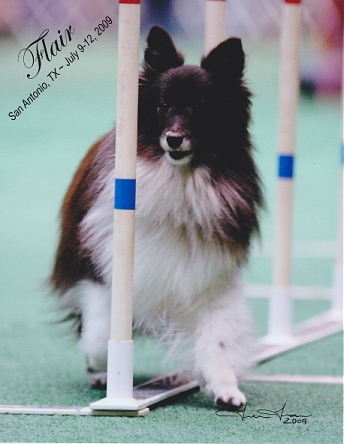 She finished her MACH4 (fourth AKC agility championship) after her tenth birthday and she also has her Rally Novice title which was earned when she was eight years old. Lyric (9 year old female) and Merlin (13 year old male) became homeless in December 2010 when their owner died. They were living outside in Tennessee, without any fence, and the neighbors where feeding them. 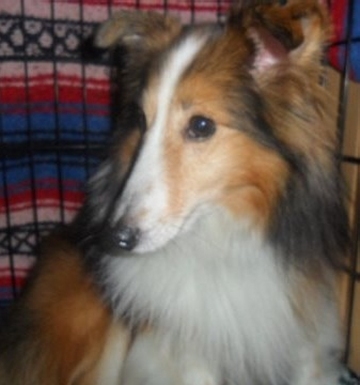 The sheltie rescues in TN were full and posted them on our national yahoo group, hoping someone would take them. The second we saw them, we knew we wanted to rescue them. As it turned out, one of our adopters was going to TN on business a few days later. Believe it or not, but her business meeting was only a few miles from where Lyric and Merlin were living. You got it, this adorable couple hitched a ride to Ohio and are now safe at PSSR. Lyric & Merlin have been together all their lives and are so devoted to each other, there is no way we will separate this precious couple. Lady is 13 years old with boundless energy. 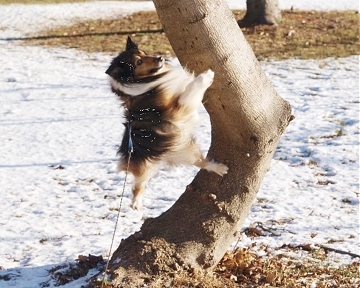 Here she is trying to climb a tree to get to a squirrel. About 7 months ago we were contacted by our local shelter about Toby who was 10 years old and his owner had died. The nephew was supposed to keep Toby or find a good home for Toby so the nephew dropped Toby off at the shelter. We were contacted because they said that he wasn't adoptable because he didn't pass their evaluation process, and his gum's were really pail and his coat was matted. Dixie pulled him from the shelter and as soon as she got him home his gum's got more color and his coat only had a few mats in it. She asked if we could foster him for a while of course we said yes. After having him for so long several our friends kept on telling us that we were going to keep him. We always said that he would find the right home. Well Toby we with us I found out that he liked to play fetch and also liked other dogs as well as kids. I volunteer as the 4-H Dog Group Leader for the Southern Nye County 4-H program here in Pahrump Nevada. During obedience if one of the kids needed a dog to practice with they would work Toby. I think Dixie took in 3 to 4 applications on Toby that all looked good. When it came down to the people adopting him they would say he was too old at 10, without even meeting him. I would always say that the right person or family would come along. About 3 weeks ago the right couple came along they live here in Pahrump and were looking at a couple of the shelties that we have available. When contacting them about doing the home check I asked if I could bring the sheltie that I was fostering along since we've been working with Toby going for rides so he wasn't so stressed in the car. 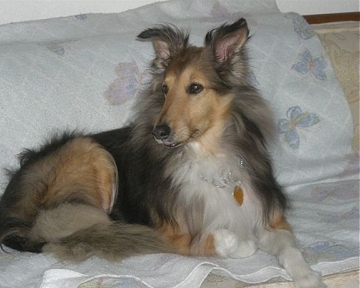 At the time I didn't know that they had looked at Toby's petfinder page and also thought that 10 might be to old, since their sheltie had passed and the age of 15 about a year ago. 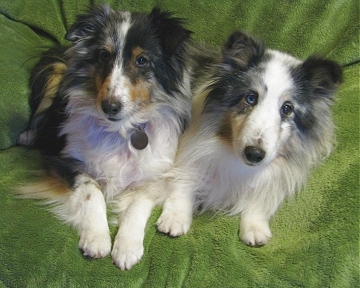 So they were actually looking at couple of our younger shelties. The woman that I spoke to asked if it was Toby who I was bring with me I said yes and she said that they would like to meet Toby. Once they met Toby they fell in love with him by the time Toby and I left her husband was on the floor playing with him. Since I was only doing a home check I didn't have any adoption paper work with me at the time so they picked Toby up the next day. 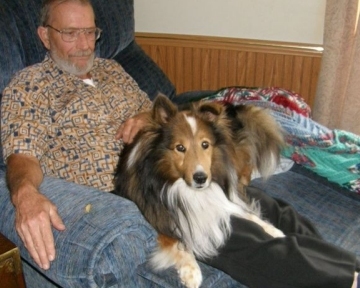 Toby is never left alone if they have to go into Las Vegas for the day they have a friend they call him Toby's "Uncle Emo", who lives a couple doors down from they who is 86 and either comes over to stay with Toby or Toby goes over to Uncle Emo's house to visit while they are in town. They are also planning to adopt another one of our rescues once Toby gets adjust to his new home. It just goes to show that our Senior Shelties still have a lot of love and life in them if somebody just gives them a chance. Prince was 10 when he came in 2008. He was HW + and grossly over weight. 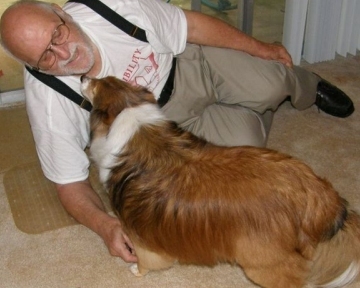 He and his new dad now live in an assisted living facility. Prince can't say enough good things about his new Dad and his new Dad feels the same way about him. They go on walks and watch TV together and just love being a family! Prince is a very special little guy and now he has a Dad just as special as he is...what more could anyone ask for. Shante was 9 when he came in, HW + and had been used as a breeder. He's 14 this month and still going strong. Shante has been placed in a wonderful home where he enjoys laying on his new dad's lap, watching his new mom fuss in the kitchen and playing with his new dog sister! Shadow is 9 and it was love at first sight for him and his new mom. A match made in Heaven. Shadow and his Mommy are doing great and having a ball in the snow. 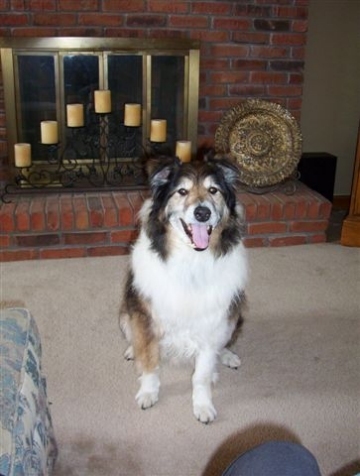 Marissa is a sweet, petite girl, who came into our lives as a foster dog at age 8. BUT... fostering lead to love and she became a member of our family in 2006. Marissa is now 13 years old and she brings great joy to our lives. She also keeps her 4 yr. old sheltie brother in line. We are truly blessed having her and very glad to give her lots of love in her senior years.